Every child needs a very special envelope for that most important Letter To Santa! This one is made from felt! 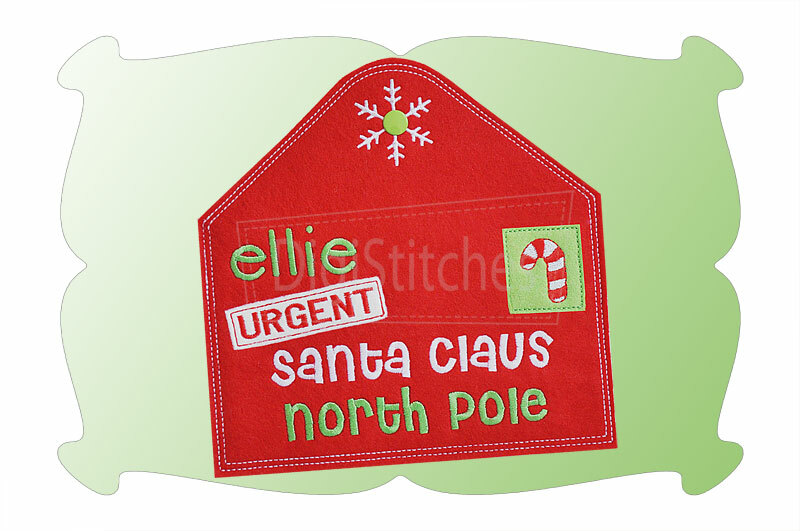 We've included a ribbon hang tag so it can be used as a Christmas ornament too! Words shown (Urgent, Santa Claus, North Pole) are embedded onto the deisgn for you. Font shown (the name Ellie) is Ainsley embroidery font and is available as a separate purchase. Made for the 5x7, 6x10 and 7x12 hoops. Every child needs a very special envelope for that most important Letter To Santa! This one is made from felt! Use embroidery software to personalize the letter (or add the year) to make it even more special. We'll show you when and where to add the name, just follow along with the PDF instructions! We've included a ribbon hang tag so it can be used as a Christmas ornament too! The back flap features a snowflake and a snap closure, but you can use Velcro if you'd like. Great money holders for older children! Also looks super cute tied on to packages! 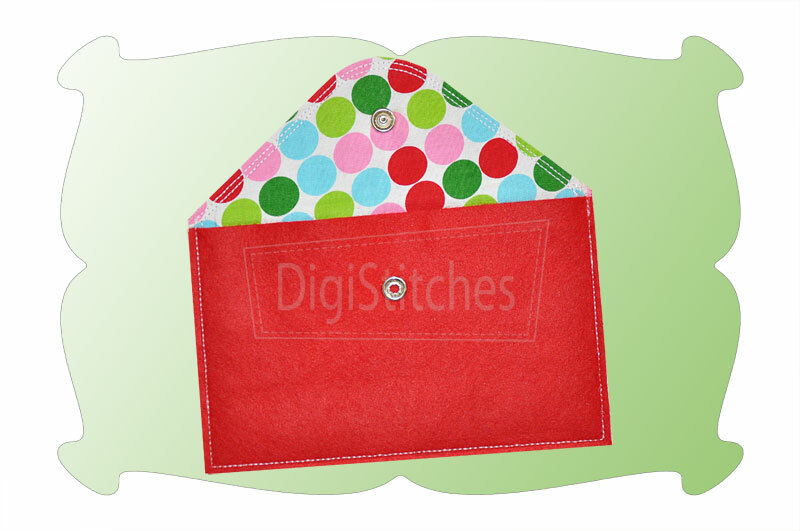 The inside is lined with fabric, so it's a special keepsake for your child's letter to Santa. Made in the hoop with no additional sewing required. Complete step by step PDF instructions with lots of helpful photos included! 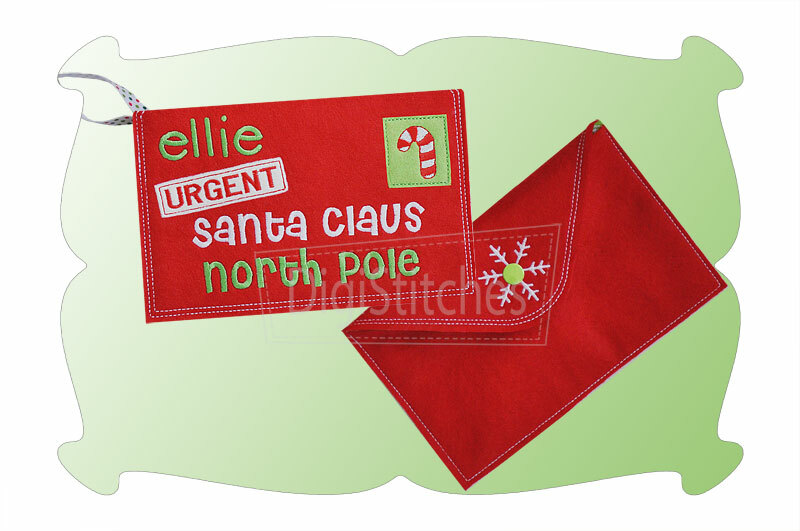 Words shown (Urgent, Santa Claus, North Pole) are embedded onto the design for you. Font shown (the name Ellie) is Ainsley embroidery font and is available as a spearate purchase. Embroidery software is needed to add a name and/ or date to the envelope. The "Letter To Santa In The Hoop" comes in 3 sizes. All sizes included with your purchase. 4x4: Not available in this size. 5x7: 4.90 x 4.89 inches. SC: 8962. 6x10: 5.94 x 5.93 inches. SC: 10,946. 7x12: 6.85 x 6.84 inches. SC: 12,780.